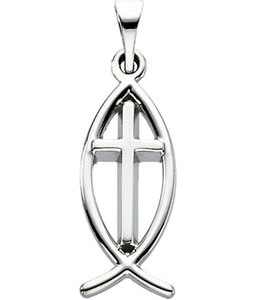 Ichthus Cross Pendant in solid 14K White Gold. The ichthus was used by Early Christians as a secret symbol. * Iota (i) is the first letter of Iēsous (Ἰησοῦς), Greek for "Jesus". * Chi (ch) is the first letter of Christos (Χριστός), Greek for "anointed". * Theta (th) is the first letter of Theou (Θεοῦ), Greek for "God's", the genitive case of Θε=ς, Theos, Greek for "God". * Upsilon (u) is the first letter of huios (Υἱός), Greek for "Son". * Sigma (s) is the first letter of sōtēr (Σωτήρ), Greek for "Savior". During their persecution by the Roman Empire in the first few centuries after Jesus Christ, early Christians used the fish symbol to mark meeting places and tombs, or to distinguish friends from foes: when a Christian met a stranger in the road, the Christian sometimes drew one arc of the simple fish outline in the dirt. If the stranger drew the other arc, both believers knew they were in good company. We guarantee our Ichthus Cross Pendant in 14K White Gold to be high quality, authentic jewelry, as described above.